Google has unveiled a tool that will allow users to customise and refine their search queries. 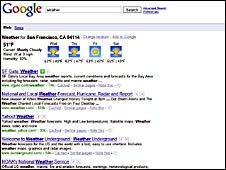 The company's SearchWiki lets users re-order, remove or add specific web search results. This means the next time they perform the same search, the personalised version will pop up. "I would call this revolutionary. It's a huge step, not a baby step in the world of search," Google's product manager, Cedric Dupont, told the BBC. "This is part of an obvious movement of the web to become more participatory, so Google search is adapting to this movement," he said. "The SearchWiki is about giving users more control over their search results and increasing user happiness," Mr Dupont added. But industry watchers predict one huge problem with the effort. "Most people are not going to engage with it and think about where the results should be - if it's above this one or below that one," said Greg Sterling, an editor with SearchEngineLand.com. "This is really for a motivated or elite core of user who really wants to participate in the process." As well as ranking results, SearchWiki allows users who have logged in to their Google account to write comments which will have a dialogue balloon next to the result when they return for any further searches. These will also be public so that others using SearchWiki can view them and get feedback on a website. Mr Dupont stressed that SearchWiki would not affect the way websites were ranked by Google. At the bottom of the page, there will be a link to take users to a page showing what search results others have re-ranked, deleted or added. Mr Sterling said that if Google managed to get a great number of people re-ranking results, it could improve the overall search experience. "Lots of people have tried so-called 'social search', combining algorithmic search with human editorial input, because the perception is that humans have the ability to craft a better result in any given situation because they can make distinctions machines can't," he said. "So this could be quite dramatic if they get a lot of people participating because it could improve the algorithms of the process and serve up better search results." Matthew Humphries of geek.com would like to see the tool available to the public at large and not just to account holders. He said that even among SearchWiki users, search would be improved. "You always see posts on forums for different subjects asking for the best resources to help with X. 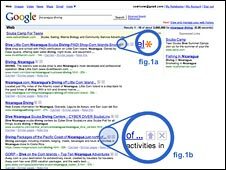 With SearchWiki the responses won't be a bunch of links, they will be a single link to an annotated Google search page," he added.